This is a weeknight winner at my house. I can have it on the table in less than 45 minutes, my husband likes it, and the leftovers are great for lunch the next day. I feel great when I make this meal because it's easy, filling, and it saves us money in the middle of a hectic workweek (dinner plus lunch the next day). This recipe contains ingredients that you can always have on hand: frozen broccoli, pasta, and cheddar cheese. I normally don't love frozen veggies, but they work in this dish, plus they are convenient. Start by cooking the broccoli (you can microwave it if it was frozen or steam it if it's fresh). I don't like my broccoli mushy, but this recipe is forgiving. Boil a box of medium shells (pasta). I used whole grain last time and it was fine (to my surprise). 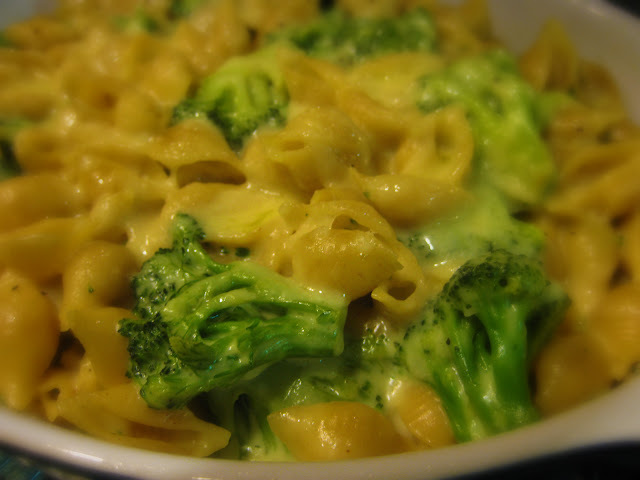 Sit the broccoli and the cooked shells aside and work on your smooth, creamy cheese sauce. I add a little fresh cracked pepper and some seasoned salt to my cheese sauce. We don't like our food salty, but we like it flavorful. This cheese sauce is so easy and it comes out so thick and creamy that I have to stop myself from licking it off the whisk. Next, you mix about 3/4 of the pasta and all the broccoli with the cheese sauce. If you use all the pasta, it'll be too dry. Of course, you could just double the cheese sauce... but anyway... just make a nice mixture. Pour it into a 1.5 quart baking dish (I spray mine with Pam), sprinkle some more cheddar on top, and place that baby under the broiler until the top gets brown and crunchy. Meanwhile, heat the butter in a large pot over medium heat. Add the flour and cook, stirring, for 2 minutes. Whisk in the milk and cook, stirring occasionally, until slightly thickened, 4 to 5 minutes. Add 1 1/2 cups of the cheese and stir until melted. Stir in the nutmeg, 3/4 teaspoon salt, and 1⁄4 teaspoon pepper. I add 1/2 t. seasoned salt and more pepper. Just taste as you cook. Add the pasta and broccoli and toss to combine. Transfer to a broilerproof 8-inch square or another 1 1/2-quart baking dish. Sprinkle with the remaining 1⁄2 cup of cheese. Broil until golden, 3 to 4 minutes. Mmmm, this is something the family would love and I think adding in the chicken a GREAT idea! I was up in the air about what to make for dinner tonight but I think this is it. I don't I have enough cheddar but I've got some mexi-blend. Thanks for sharing and I'll let you know how it goes! Btw, Merry belated Christmas and Happy New Year! Ingrid, I use Mexi blend all the time. It'll be great. Hey, Keeley! I made it tonight! It was GREAT! For my cheeses I used 4 oz of sharp cheddar and velveeta. I added my spices to taste (loved the nutmeg! )and threw in some garlic powder. I did add chicken chunks but my big change was using spinach instead of broccoli. I didn't have any! I did have three bags of frozen spinach and one bag of fresh so spinach it was. Thanks again! Woah. This looks fantastic! I love the close-up shot. I found your site from "Lick the Bowl Good", and I'm glad I did!